What kind of jungle is made up of national and international policies, services and infrastructures of open science? Can this jungle be defined, and can you survive it? 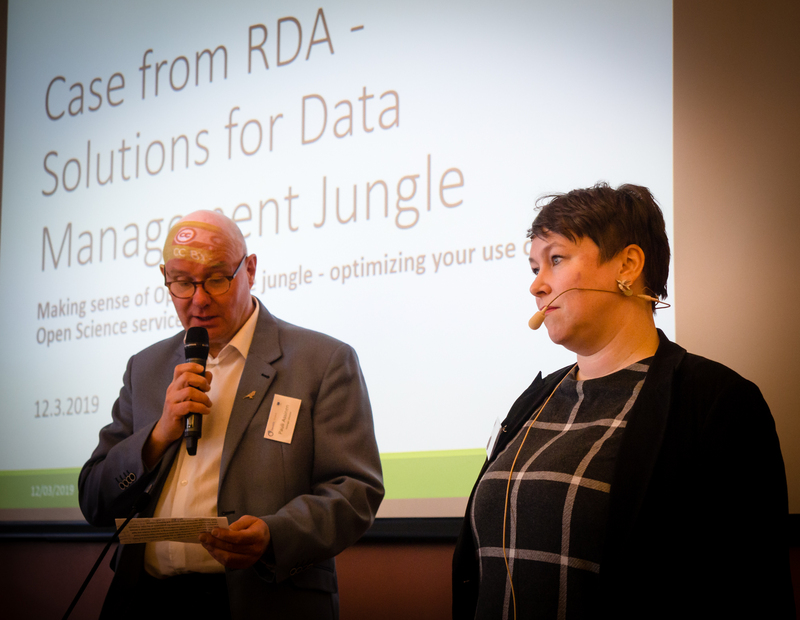 The OpenAIRE event, Making sense of Open Science jungle – optimizing your use of Open Science services, was looking for answers to the above questions in Paasitorni, Helsinki on 12 March 2019. The event was organised by the Helsinki University Library, which is the national open access desk (NOAD) for OpenAIRE in Finland and the Federation of Finnish Learned Societies, which is responsible for the national coordination of open science. 57 people from 24 research organizations from three countries attended the Paasitorni all-day event, and tens of participants participated online. What are the most important policies? In his opening speech, Sami Niinimäki, Senior Officer from the Ministry of Education and Culture in Finland sought to clarify the jungle of European policies. Niinimäki listed the most important guidelines for open science. A key text for Niinimäki was the European Council's Council conclusions paper on the transition to an open science system (27 May 2016), which explicitly deals with open science, as opposed to how many other papers only refer to the theme. Niinimäki highlighted the key points in the Council's paper's eighteen paragraphs: the most important guidelines related to open access by default (paragraph 10), open access to publications by 2020 (12), openness of research data (14), FAIR principles of data (16) and the need for concerted actions (18). "These paragraphs are not yet legal regulations, but they must be taken seriously," Niinimäki stressed. Niinimäki also highlighted the European Union's framework programmes for research and innovation, Horizon 2020 and the subsequent Horizon Europe (2021–2027), which sees open science as a modus operandi. The framework programmes are extremely important in shaping open science policy in Europe. In his tight-knit presentation, Niinimäki also focused on another EU recommendation paper (Access to and preservation of scientific information in Europe, 2012), and stressed the importance of the European Research Area (ERA) and the European Strategy Forum on Research Infrastructures. "When actors like ESFRI work on FAIR data themes, we know that something is really happening," Niinimäki said. Recently, European science funders' cOAlition S and Plan S have received more attention than other policies. Jyrki Hakapää, Science Adviser from the Academy of Finland, a member of the Plan S coalition, listed the services, infrastructures and policies needed to implement the ambitious Plan S.
How can a researcher find EOSC services? In addition to the open science policy jungle, the OpenAIRE event also focused on the jungle of research services. Particular interest focused on the services provided by the European Open Science Cloud (EOSC). However, Saara Kontro, Project Manager from CSC – IT Center for Science and EOSC Secretariat, stressed that as the EOSC process was only in its implementation phase, not much could be said about these services yet. Launched in November 2018, the EOSC portal (eoscportal.eu) currently consists of 154 services from 17 service providers. With an ever-expanding range of services, EOSC seeks to support data-driven research and international research collaboration, claimed Kontro. According to the plan, the EOSC will be operational in 2021, by which time European research services will have shifted from "fragmentation to a federated model" with unified access to services. In the public discussion and in the workshop session, the participants considered the researcher's perspective as crucial: Why would a researcher choose EOSC services if different services are available? According to Saara Kontro, EOSC services have the advantage of a wider range and interoperability. For Pauli Assinen, Head of Development from Helsinki University Library (OpenAIRE NOAD), interoperability is the key concept in the EOSC – but at the same time, one of its greatest challenges. To sum up, support for finding services is sorely needed. A small survey taken during the workshop showed that as many as 66% of the current EOSC catalogue's services were not familiar to any of the participants. The best-known services were Zenodo, Eduroam, B2DROP and Figshare. The OpenAIRE portal also ranked the top 10 most well-known EOSC services in the survey taken in the workshop session. The OpenAIRE portal gathers information, full texts and data on European research. Institutional repositories play an important role in producing this information – the metadata they provide should be suitable for OpenAIRE harvesting. In a survey conducted by the Helsinki University Library last year, Finnish institutional repositories expressed their views and experiences on OpenAIRE harvesting. According to the survey, repository managers support stronger national coordination in OpenAIRE harvesting, and also reported that the VIRTA service can be utilized for centralized OpenAIRE harvesting. The VIRTA publication information service compiles information on Finnish research and covers about 60 000 publications a year. Wishes often come true, and Joonas Nikkanen, Project Manager from CSC, responsible for the VIRTA service, presented the OpenAIRE integration, which will be implemented this year. According to Nikkanen, the centralized OpenAIRE harvesting of Finnish research's metadata is not only smart but also relatively easy, and the technology is ready. Basically, OpenAIRE is only one of the VIRTA API utilisers. However, producing high-quality metadata data will still require work of metadata producers. What about the Finnish jungle? At the end of his opening speech, Sami Niinimäki also briefly discussed the Finnish open science scene. Of particular importance to Niinimäki was the coordinating role of the Federation of Finnish Learned Societies (Tieteellisten seurain valtuuskunta, TSV) in open science activities in Finland. Sami Niinimäki presented open science actions in Finland. Henriikka Mustajoki, Head of Development at TSV, introduced the Finnish Open Science Coordination, which began activities last year. The coordination model is based on open involvement and collaboration, and covers the research community very widely. Compared to other countries in Europe, this is quite a unique way of organizing open science activities. The Open Science Coordination model is presented more specifically on Avointiede.fi/en. According to Mustajoki, the open science to-do list in Finland contains agreat deal of extensive tasks, such as the new roadmap for open science, the national recommendation for responsible metrics, the national strategy for open access and the open data strategy. In research data issues, Finland is one of the international forerunners, and at the moment, the only national contact point for Research Data Alliance (RDA) in the Nordic countries is the RDA Finnish Node. At the Paasitorni event, RDA Finland's new coordinator Heidi Laine from CSC presented the RDA's work on open data. With regard to jungles, the RDA helps researchers by creating consistent practices and tools to enable the open sharing and re-use of data. From the Finnish perspective, Laine listed the most urgent issues – RDA outputs, which need to be localized: Metadata Standards Directory, Scalable dynamic data citation methodology, Workflows for Research Data Publishing, and Persistent Identifier Type Registry. There you find also Event summary-document, in which there is information about speakers, whole results of the workshop and results of the feedback, e.g. participants' takeaways.